Approximately 200 guests joined us on 10/3/17 at the South Park Center in Downtown L.A. for our Future Forum about the Future of Work. 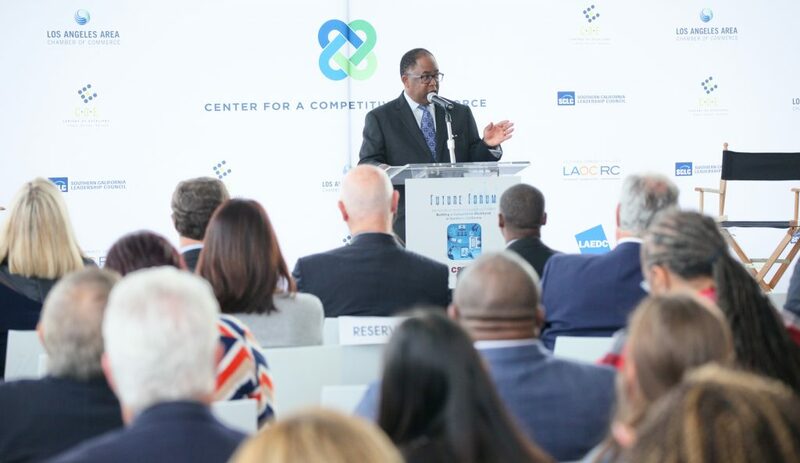 The event opened with a press briefing unveiling the new and unprecedented report by Center for a Competitive Workforce, comparing the talent supply and demand in the L.A. region, with a focus on our region’s 19 community colleges. The report looked at 20 in-demand, middle-skill occupations and six key employment industries in the Los Angeles basin. The briefing included remarks from: L.A. County Supervisor Mark Ridley-Thomas, Chair of the Board of Supervisors; ASM. Autumn Burke, AD 62, Chair, Select Committee on Career Technical Education + Building a 21st Century Workforce; ASM. Raul Bocanegra, AD 39, Chair, Select Committee on Growing Jobs in San Fernando Valley; Sydney Kamlager-Dove, President of the LA Community College District Board of Trustees; and Richard Verches, Director, LA|OC Regional Consortium of Community Colleges. Following the briefing, attendees heard from our slate of speakers and panelists including: Michael Spagna, Provost, CSUDH; Art Bilger, Founder & CEO, WorkingNation; Mitra Best, U.S. Innovation Leader, PwC; Dr. Somjita Mitra, Director of LAEDC’s Institute for Applied Economics; Ken O’Donnell, Interim Vice Provost, California State University Dominguez Hills; and Dr. William Scroggins, Mt. San Antonio College, President & CEO. View photos from the event here, and watch the event in its entirety by clicking on the video below.